It was just 85 days ago that the world's richest man, Jeff Bezos and his wife of nearly 25 years, MacKenzie Bezos announced their separation, shocking pretty much everyone outside of their inner circle. Now, it's over. Finished! Finito! Fini! Terminado! Fertig! Acabado! 完成 (Kansei)! It was largely thought that MacKenzie stood a good chance of walking away with 50% of the Amazon/Bezos fortune. After all, when they met in 1992, Jeff was a mid-level stock broker. She was integral in the early days of Amazon. When the couple moved from Boston to Seattle to found Amazon in 1994, she drove while he wrote the business plan. Neither of them had any idea that this plan of Jeff's would revolutionize the way people shop and earn them a $150 billion fortune. In the final divorce settlement, MacKenzie received $35.6 billion of Amazon stock. That accounts for about 4% of the outstanding shares of the company. She has agreed to let Jeff retain voting control over her stake. Jeff retains about 75% of their former combined stake. MacKenzie is now the third-biggest shareholder behind Vanguard investment fund and Jeff. She has also relinquished her rights to The Washington Post and Jeff's space exploration company Blue Origin. There is not yet any word on how Jeff and MacKenzie are splitting their multiple homes and private jets. The couple has four children: three sons and one daughter they adopted from China. With the $35.6 billion dollar settlement, MacKenzie Bezos becomes the 4th richest woman in the world behind Jacqueline Mars, Alice Walton, and Francoise Bettencourt-Meyers. The divorce settlement makes her the richest author in the world by far. MacKenzie wrote the novels The Testing of Luther Albright (2005) and Traps (2013). Formerly, J.K. Rowling was the wealthiest author with a $1 billion net worth and James Patterson was the second wealthiest with an $800 million net worth. MacKenzie Tuttle was born in San Francisco on April 7, 1970. Her dad was a financial planner and her mom was a homemaker. She graduated from the prestigious Hotchkiss School in Connecticut in 1998. From there she headed off to Princeton to get her bachelor's degree in English with highest honors in 1992. One of her mentors was Nobel Prize winning author Toni Morrison, who called MacKenzie "one of the best students I've ever had in my creative writing classes." In 1992, MacKenzie and Jeff met at the Wall Street firm D.E. Shaw. Jeff had graduated from Princeton in 1986 and was working in the computer science field. By the time MacKenzie Tuttle walked through the doors of D.E. Shaw, Jeff was a VP at the firm. Jeff was the first person to interview her. He had the advantage of seeing her resume before he met her, so he knew how smart she was. She was hired and became an administrative assistant. She once told Vogue that she took the job to pay the bills until she wrote her novel. After all, that's all she ever wanted to be, a novelist. She started writing at age six when she finished a 142-page book called The Book Worm. That early book was destroyed in a flood, giving MacKenzie a lifelong habit of backing up her work frequently. MacKenzie and Jeff had offices near each other. She could hear him laughing all day long and once told Vogue that she fell in love with his laugh. MacKenzie made the first move and asked Jeff out. They went to lunch. Three months later, they were engaged and six months after their first date, they were married. Jeff was 30. MacKenzie was 23. After they were married, Jeff told his new wife about his idea for Amazon. MacKenzie could hear the passion in his voice when he talked about it. Within a year, the couple had quit their jobs, packed their bags, and set out on that fateful 1994 cross country trip to Seattle during which Jeff wrote the business plan for Amazon while MacKenzie drove. How could the young couple have known that Amazon would go on to become one of the most valuable companies in the world? MacKenzie became one of Amazon's earliest employees when she took a job as an accountant. MacKenzie helped brainstorm names for the company and shipped early orders through UPS, according to the book The Everything Store. She was integrally involved in Amazon's transformation from a small online bookseller to the e-commerce giant it is today – the second company in U.S. history to be valued at over a trillion dollars. Amazon went public in 1997. Jeff and MacKenzie were wealthy by then, but they continued to live in their one-bedroom rental house in Seattle until 1999. In 1999, the Bezos family moved into a $10 million home in Medina, Washington. MacKenzie got pregnant with their first child. As Amazon grew, Jeff and Mackenzie tried to maintain a normal life. They ate breakfast as a family. Jeff never scheduled early morning meetings in order to have this time with his family. Until 2013, MacKenzie drove their kids to school and Jeff to work in the family Honda. Jeff did the dishes after meals. As Amazon flourished, MacKenzie stepped back and focused on her family and her writing. She spent a decade writing her first novel The Testing of Luther Albright, often getting up early to write before her family arose. The novel tells the story of Luther Albright, an engineer whose professional and personal lives begin to unravel in the 1980s. MacKenzie's second novel, Traps, was published in 2013. It follows a reclusive film star named Jessica Lessing as she emerges from hiding to confront her father – a con man who had been selling her out to the paparazzi for years. Since the announcement of the separation, MacKenzie has kept a low profile. She has not been photographed since the divorce announcement. Will MacKenzie go the route of Laurene Powell Jobs and become heavily involved in philanthropy? Will she publish more novels? 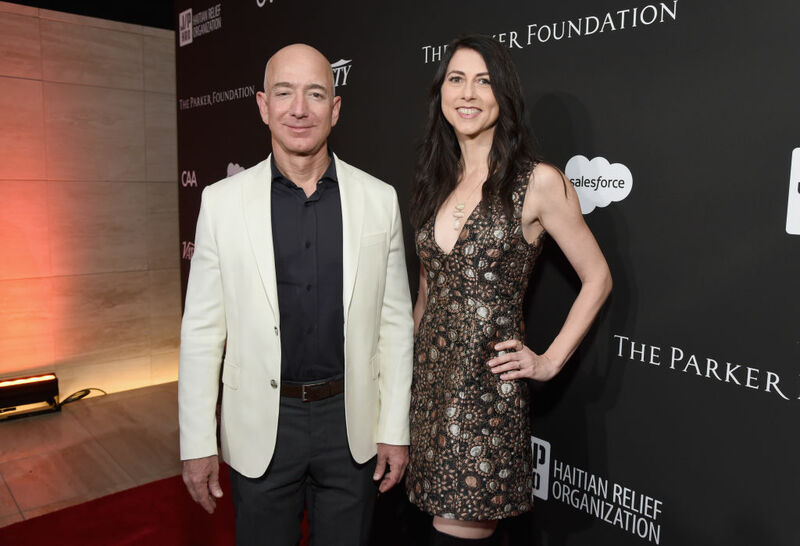 The New York Times spoke to some off the record publishing executives who were gleefully excited about the blockbuster potential if MacKenzie Bezos decided to write a memoir. Now that is a book I'd read!